At Lake Inle, the realization that I have barely a week left on my Burmese visa hits with a bittersweet bang. There is so much I still want to experience in this wonderful country. A boat trip up the Irrawaddy has been on my list from the beginning. This would require a 10 hour bus trip back to Bagan, an overnight stay, and another full day traveling up the river to Mandalay. I so enjoyed my trek through the hill tribe regions to Inle that another trek further north in Shan State is becoming more desirous. I want to check out some of the mountain towns. I want to do a train ride across the Gokteik Viaduct. I want, I want, I want. Visas cannot be extended. There is not enough time to do it all. It is time to prioritize my options! 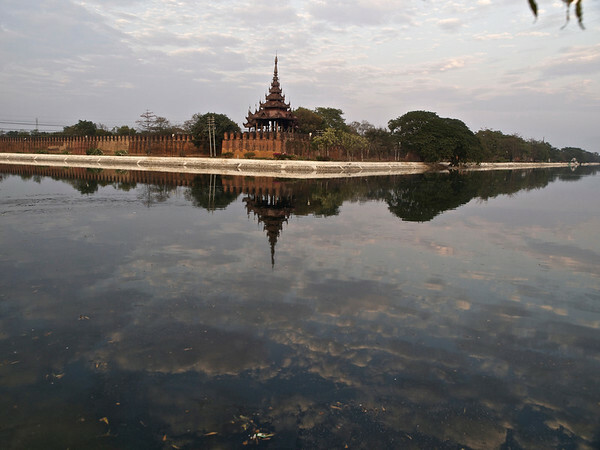 After hours of vacillation I decide to bag the boat trip and fly to Mandalay. This will give me two extra days in the north, enough time to do the majority of my wish list and allow for the (un)expected travel delays. It is super easy and cheap, about US$50.00 the same as the bus and boat trip. 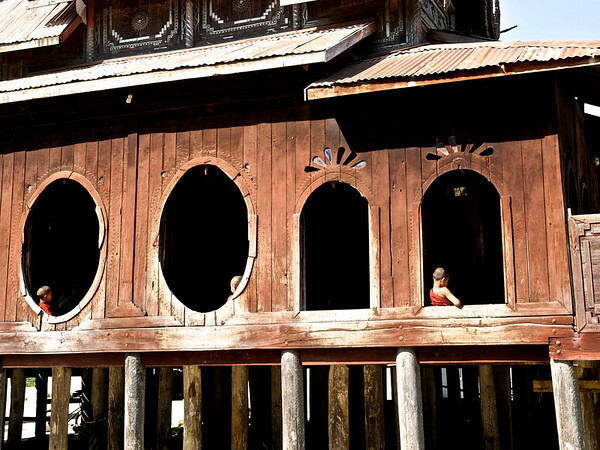 First is a one hour taxi to the airport including a stop at Shwe Yan Pyae Temple, built out of teak 125 years ago. At the airport I check in. There is no security at all! No x-ray, nada. The plane is late of course; but we are off and it is only a 25 minute flight. Then a long taxi ride into town but I arrive at Sabai Phyu, where I have made a reservation. My first impressions of Mandalay are not great. It is a smoggy traffic-filled pit to put it nicely. At the hotel, I am informed that they are fully booked even though I made a reservation. They tell me they can give me a room with a shared bath for $13, which I accept having little choice. 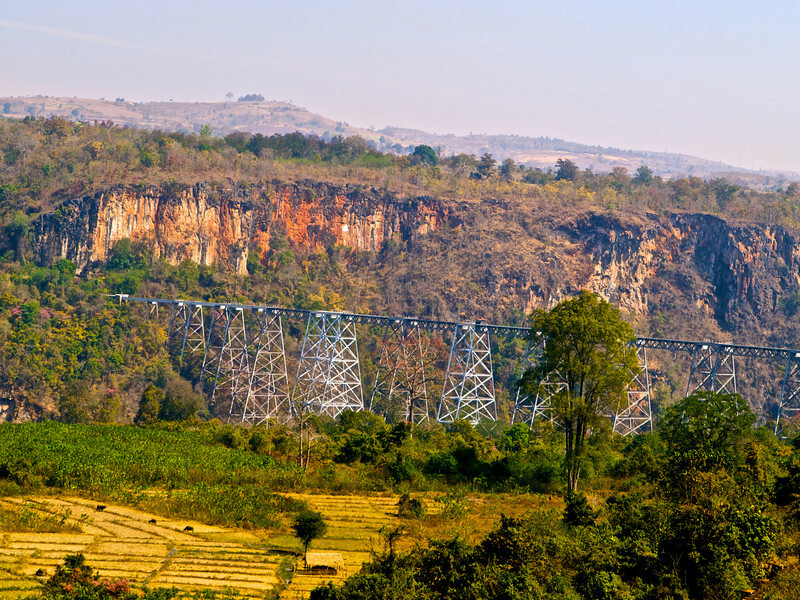 It’s only about 3:00 pm by now so I am hoping to see a few sights, book passage to Pyin Oo Lwin for the morning and catch the train to Kyaukme (pronounced ‘chow-may’). It gets worse. The room is a windowless cell with barely enough room to stand next to the bed which is just a mat on wooden slats. OK, hopefully I will get some sleep tonight. The walls are topped with mesh. You can hear every whisper in every room. The bed has a mosquito net so I have a feeling I will need that later. Finally I find a street agent (desk and phone on the curb) who will book me a shared taxi to Pyin Oo Lwin and pick me up at my hotel at 6:30 am which, according to the hotel manager, should be enough time to make the train connection. I want to catch the sunset from Mandalay Hill but now it is too late. I haven’t had any lunch so I inquire about dinner as it is almost 6:00 pm and many restaurants in Burma close by 7:00. The hotel manager recommends a veggie Indian place down the street called Napali. It is almost empty when I walk in. I sit and order. 20 minutes go by and no food. More people have come in. They are getting served. I ask twice and am told just another few minutes. Finally, after 45 minutes I walk out in disgust. I am really not liking Mandalay at all! I walk across the street and find another Indian restaurant. They have chicken liver curry which sounds good and different. Within minutes, a feast is being laid out before me. It’s really good, especially the curry. I am stuffed and decide to sit and read a bit ordering a bottle of Myanmar Beer. Finally, I walk back to the hotel feeling full and a bit light headed and sleepy. I am wanting to go see Mustache Brothers perform and I can go in an hour. However, when I get back to the room, I realize I am drained of energy. So I shower and go to bed in my cell by 8:30, waking several times during a night of restless sleep. 2/11/13–I am up and waiting for my shared taxi by 6:15 am. It never shows!! I am really fed up with people lying to me in this town and am feeling quite judgmental. Finally, I grab my gear and set off on foot to see what I can find. There is no way I am going to spend another night in this dump or this town! After some walking around (at least it is still cool so I am only sweating a little from exertion) I find a guy with a shared taxi who will take me to P.O.L. for 1500 kyat (US$ 1.70) as opposed to the 6,000 kyat the ‘middle-woman’ had quoted me for the no show. The taxi soon loads up with locals and we are on our way. The cool breeze hits my face and I start to regain my positive attitude. The locals all stare at me for awhile, not sure what to make of the gringo with the backpack. It’s the typical truck taxi with two hard benches along each side in the back. It’s a lot like the bus in Harry Potter. He drives really fast, passing everything and honking constantly. It’s actually fun and even though we left an hour after I had planned, I am hopeful there is still a chance to catch the train. However, I am holding a neutral detachment on that for sure! There are several stops along the way. People get off and on. I get to the train station at 9:30 am and find that the train left at 8:20. This is it’s departure time, not the 10:00 am time the lying clerk at the hotel told me. Another strike for them (see their review in my travel tips). 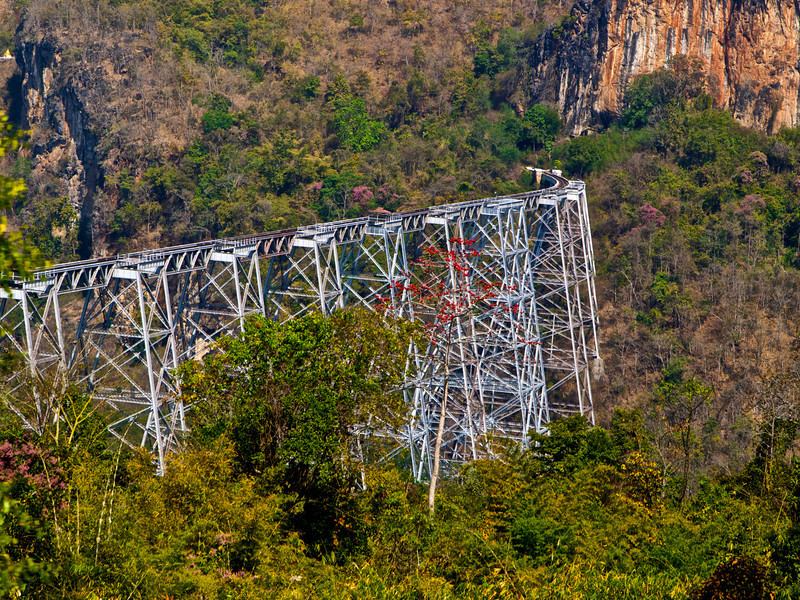 I think I will take a bus to Kyaukme which sadly means no train ride across the gorge. Then I can still meet Nine Nine as planned for a trek. But after an hour at the bus station, which is just a strip along the highway, I am finally told that the next bus is at 3:00 pm. Not wanting to wait five hours in the midday heat along the highway, I grab a moto taxi to the Brava Hotel and they have a room…a very nice room….with hot shower and private bathroom. The manager, Morgan Freeman (yep, that’s how he introduces himself and there is a striking resemblance) is personable and very helpful. He points out favorite places to eat and a nice route for a self-guided walking tour. I have called Nine-Nine and he has told me no problem. “It’s a holiday, come tomorrow.” I shower and feel great again. I will explore this old colonial town today. Pyin Oo Lwin was built by the British as a summer retreat administrative capital to escape the heat of Mandalay. 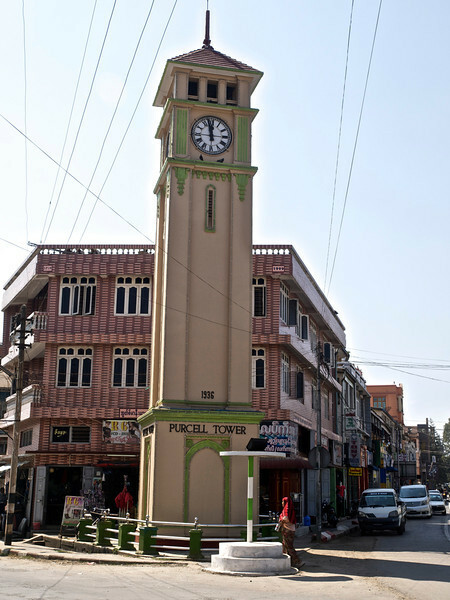 They even erected a clock tower to remind them of Big Ben. I lunch at Golden Triangle Restaurant where I have a decent hamburger and my first real coffee…wow, Western food is a novelty for me. Then I am off to wander the colonial architecture and find some wifi to book a flight back to Bangkok and a room there for next Sunday. Around 6:00 pm I take a motorcycle taxi to find Feel Restaurant which is said to have western dishes, sushi and sashimi. It has none of those, only the usual Burmese-Chinese fare, so I go to Club Terrace and have a tasty authentic Thai Chicken Curry with Coconut Milk. Back at the Bravo, it’s a beer on the roof and off to another early bed. 2/12/13–Breakfast on the roof of Hotel Bravo and I am off by 7:30 am with two French ladies in a taxi headed for the train station. I buy my ticket and soon board the train. Along the way a Burmese woman befriends me and offers some delicious sesame sweet treats. We talk a bit. I also meet a Dutch man, a German man and a female Indian journalist living in Hong Kong. We are all solo travelers so we have much to converse on and off along the way. Around 11ish we get to the gorge and it is rather impressive. 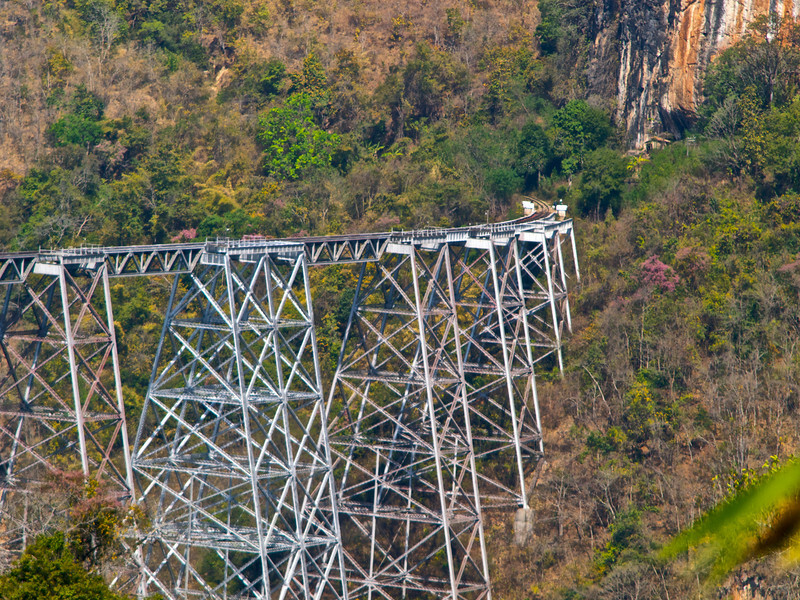 It is the highest bridge in Myanmar and when it was completed, the largest railway trestle in the world. The bridge was constructed in 1899 and completed in 1900 by Pennsylvania and Maryland Bridge Construction. The viaduct stretches 689 metres (2,260 ft) from end to end. 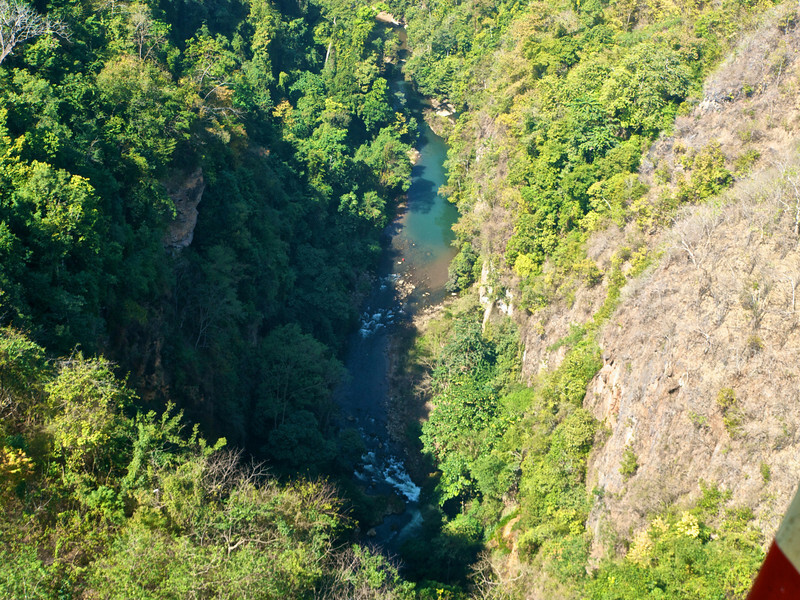 The height of the bridge to the river below is 250 meters. Due to its technical and natural condition it was considered as a masterpiece of the world standard when completed. We stop, get off and snap more photos before beginning the creaking trip across. It is definitely an engineering marvel and standing in the vestibule and looking straight down is, well breathtaking. We chat some more during the rest of the trip and I arrive in Kyaukme. The German has decided to join my trek and Nine-Nine is there at the train station waiting to greet me. We motor to the only legal tourist hotel in town and get settled. A French couple will also be joining our trek. Nine-Nine invites us to his home and we graciously accept. There we meet his wife and the middle of three daughters. They serve us tea, sticky rice and oranges. We converse and he shows a letter explaining his remarkable past. The short version is he was badly beaten and almost had his legs broken by the army. A woman from an influential family witnessed and interceded, saying he was her boyfriend (they had never met). 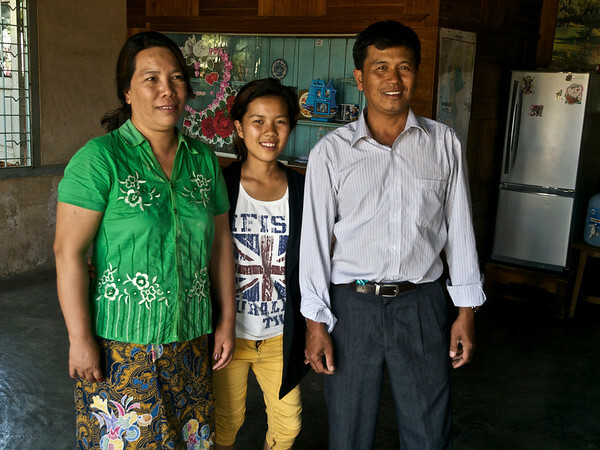 They have now been married over 30 years and have managed to put all three daughters through college, not an easy feat in Burma. After awhile we return to our rooms. Around 6:30 pm our new foursome heads out to a good Chinese dinner. We are all excited at the promise of tomorrow. Wow! What an experience this was for you. Probably one of the more challenging in your travels. Thanks again for taking me with you to places I will most likely never be able to go to! Also, great news to hear that the sutures and pins were removed. That must feel so wonderful and “freeing” for you in so many ways! Thanks Judie. I report the challenging times of travel as well. The biggest thing I have learned in they don’t last and if one is flexible, then they often lead to even better travel experiences. Thanks Mindy. I think you should put Burma and SE Asia on your travel list. Another very interesting and inspirational post. So good to hear that your hand is feeling better and that your spirits are rising back to their ‘normal’ lofty heights! Thanks Brian. I think yo would like Burma.